David Walker & High Praise | God's Got It - AVAILABLE ONLINE NOW! Welcome to our website! Feel free to browse through our content. Don't forget to purchase our new album, "God's Got It" today from Google Play, Amazon MP3 or iTunes! God bless. David Jermaine Walker was born and raised in the Admonition of Christ in Atlanta, Georgia. He was blessed to be reared in a faith-based home where God anointed him with a musical gift. David is the youngest of nine children, and he knew that he would later use his gift as a ministry tool and as an instrument to be offered up as a sweet smelling savor unto God. David has served in several musical capacities for various churches such as: Elizabeth Baptist Church, The Enon Church and Ministries, The Move of God, North Avenue Missionary Baptist Church, Born Again Church of Our Lord Jesus Christ, Faith Apostolic, Deeper Life In Christ Ministries, Covenant Ministries and All Nations Life & Praise Center. 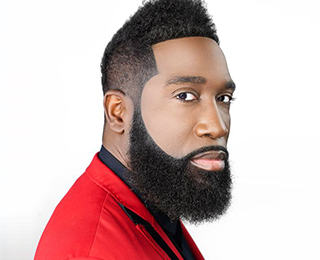 He also has been favored to direct on several recordings, including Pastor Keith Brooks and New Creation’s “Testify”, as well as Dottie Peoples’ “The Water I Give” and Dottie Peoples first independent endeavor, “Do It”. David recently served as Director and vocal coordinator for LaShun Pace’s Live Recording, “Reborn” (February 28, 2011). David currently serves along side, the living legend, Rev. Milton Biggham, as the Minister of Music for the world renowned Georgia Mass Choir. In 1993, God richly smiled upon David, giving him divine favor in gathering an anointed aggregation of singers – David Walker & High Praise (DWHP) – as a voice proclaiming the good news of God through music. DWHP has been blessed to minister to many audiences around the Atlanta area, as well as various cities and states around the country. In 1994, DWHP had the opportunity to share their ministry with Dr. Bobby Jones in Nashville, Tennessee during his Annual Gospel Explosion. DWHP was nominated for Best New Artist for the 2004 Atlanta Gospel Choice Awards. They have also served on selective programs with various artists such as, Albertina Walker, Dorothy Norwood, Leanne Faine, Kim Burrell, Dorinda Clark Cole, Karen Clark Sheard, Ricky Dillard & New Generation, Hezekiah Walker & Love Fellowship Crusade Choir, and James Hall & Worship & Praise just to name a few. This collage of singers from different denominations have been placed on a mission, fueled by prayer and directed by the Word of God, to follow a predestined path as they travel on their journey. They are commissioned to encourage the broken hearted, heal the sick and uplift those in despair through song. They endeavor to inspire every believer in releasing all praises to a worthy and loving Savior. DWHP are willing instruments being used by God to let everyone know that God IS. The vision of DWHP is to further the ministry and spread the gospel in an acceptable music form; and their goal is to be used as harmonious vessels, declaring the truth and to show the young and seasoned that to “Live is Christ”. In October 2004, the Lord favored DWHP to release their debut project entitled “So Long”, which is now available! DWHP is currently preparing for their sophomore project, anticipated to be recorded “Live” in August of 2012. David’s desire is simply to be a living sacrifice, holy and acceptable unto God, which he understands to be his reasonable service. As the Lord continues to lead him, so shall he go in the Name of the Lord! David is married to Akilah Walker and also the proud father of two beautiful children, daughter, Takeiyah Ariyana and son, David Jermaine II. © 2013-2016 High Praise Ministries. All Rights Reserved.